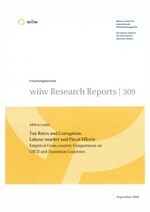 The paper attempts to explain how tax rates, the extent of corruption and various institutional aspects of the labour market influence the relative size of different segments (unemployment, employment, self-employment and activity in the hidden economy) of the labour market as well as the tax revenues in both developed market economies and transition countries. Based on theoretical assumptions and methodological considerations, alternative regression calculations are carried out on data for 28 OECD countries and partly on 18 transition countries for the period 1995 to 2000. A methodological novelty of the investigation is the establishment and testing of a new variable, the subjective tax rate.